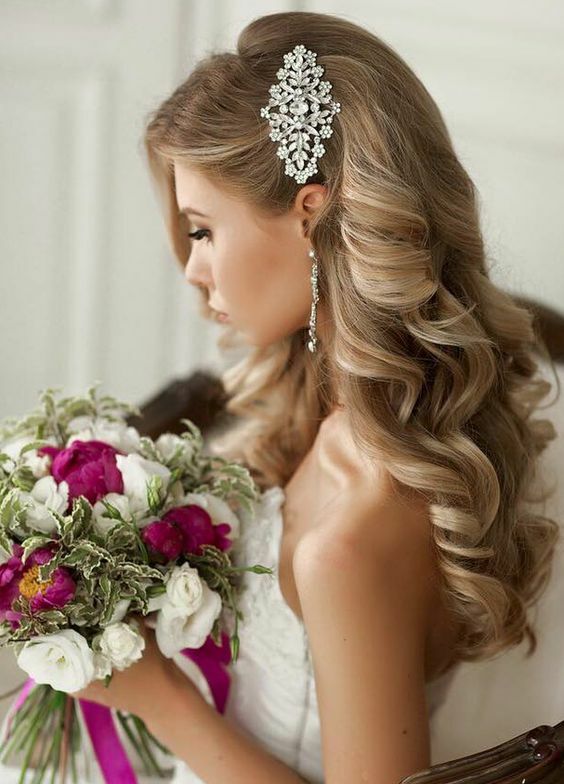 Every woman wants her bridal look special and beautiful. 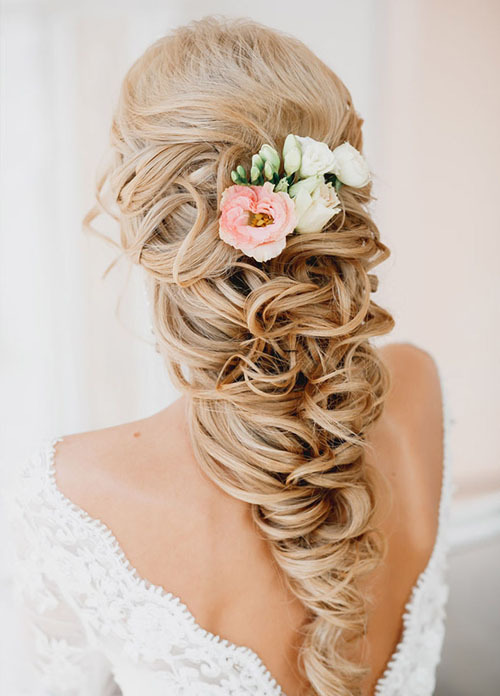 One of the most important thing a bride needs to consider about is her wedding hairstyle. 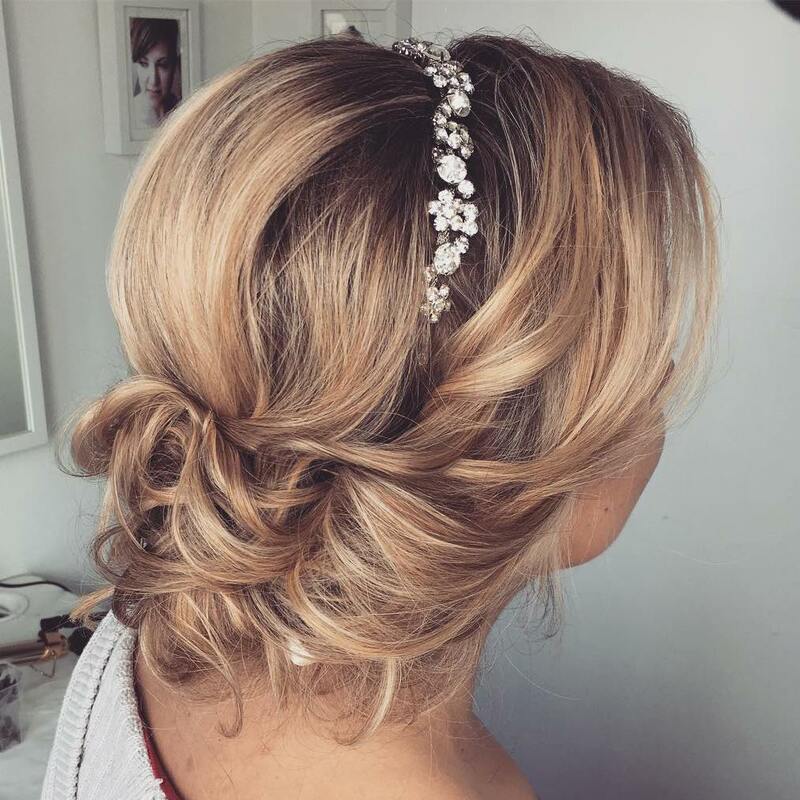 If you are searching for a stylish wedding hairstyle, then you are in the right destination. 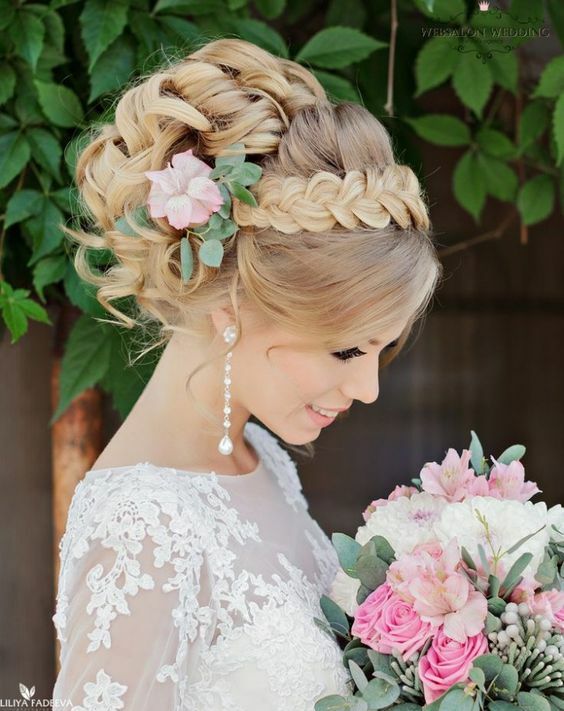 In today’s post, we would like to show you a collection of the most beautiful wedding hairstyles in this year. There are plenty of options. 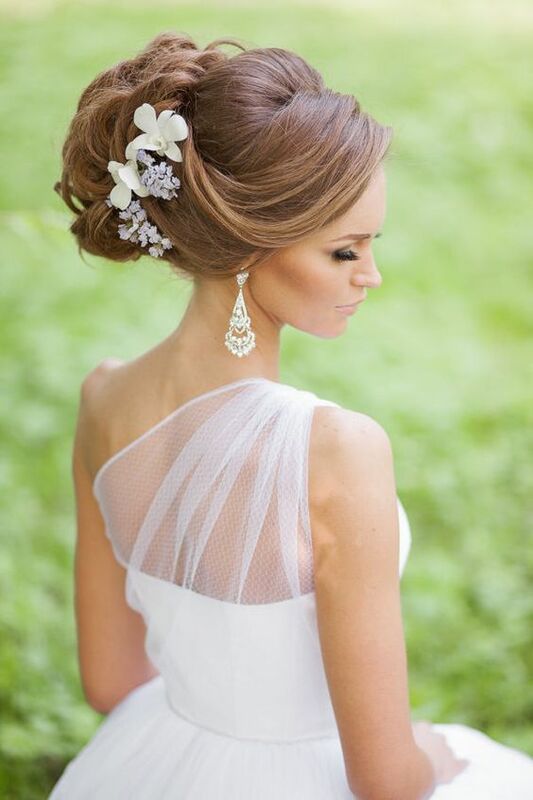 An updo hairstyle is quite graceful while the half-updo hairstyle is more romantic. 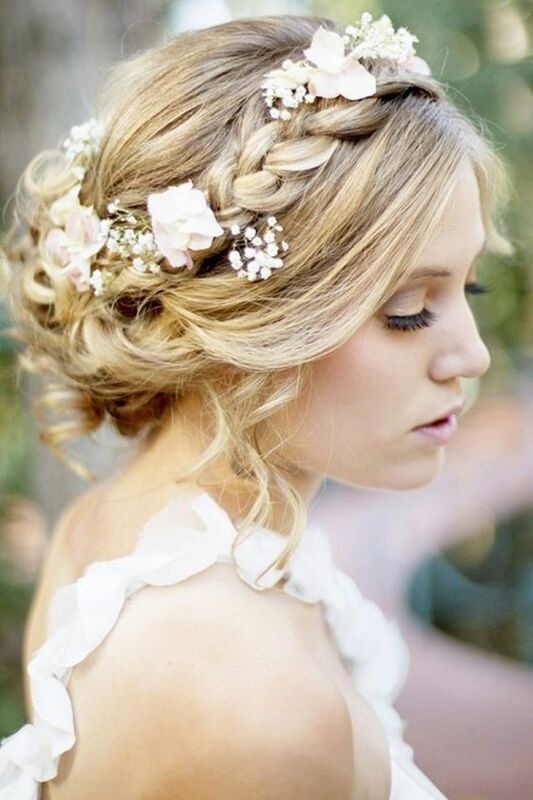 If you’ve got long hair, you can make a lovely braided hairstyle on your big day. 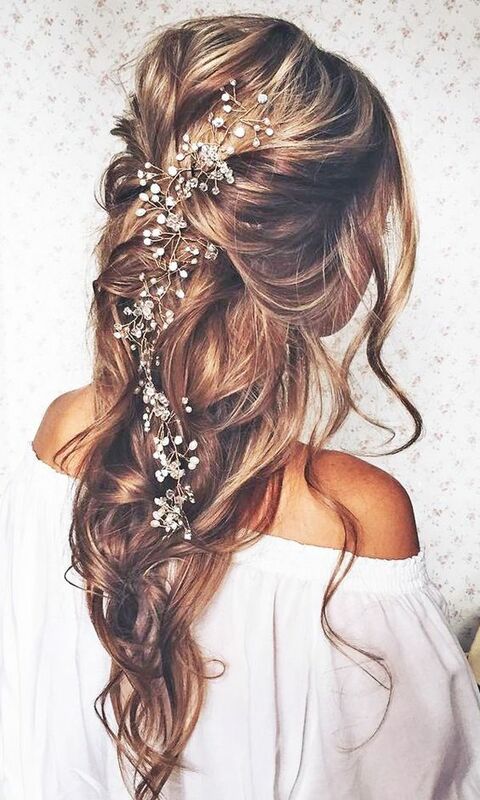 whatever hairstyle you decide to try, you will always look fabulous because they are all quite fashionable. 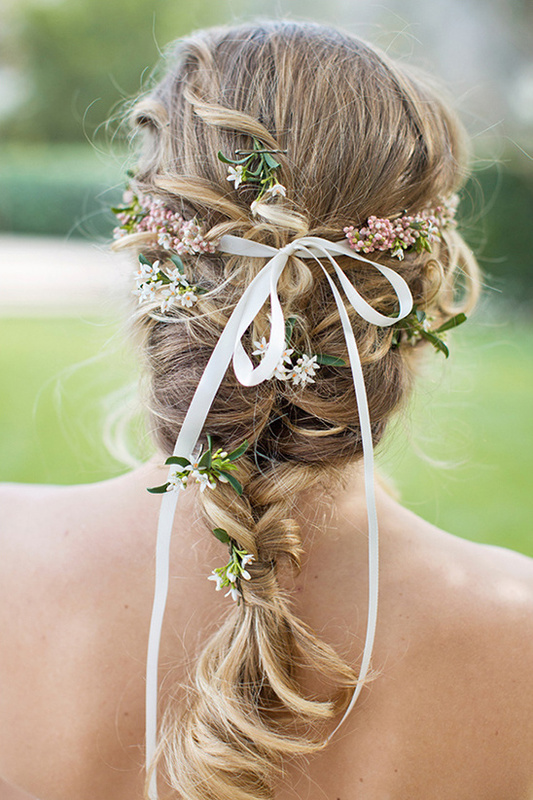 Now, check out these 18 wedding hairstyles and get yourself inspired. 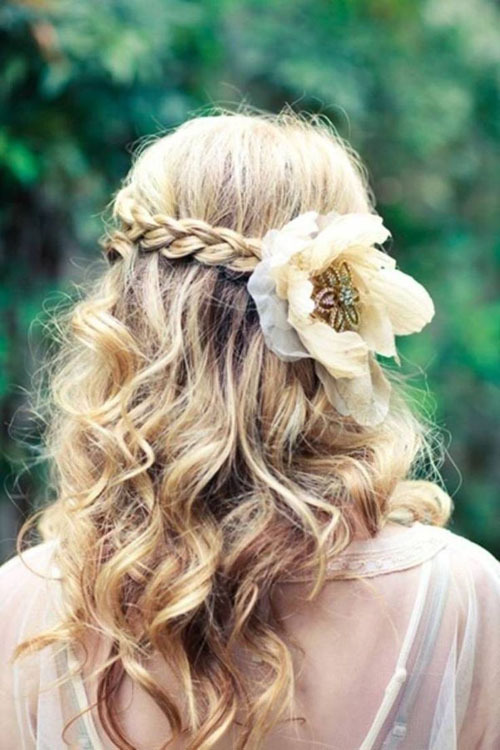 Cute flower hair accerssories and a braid add a lot of feminity to the hairstyle. 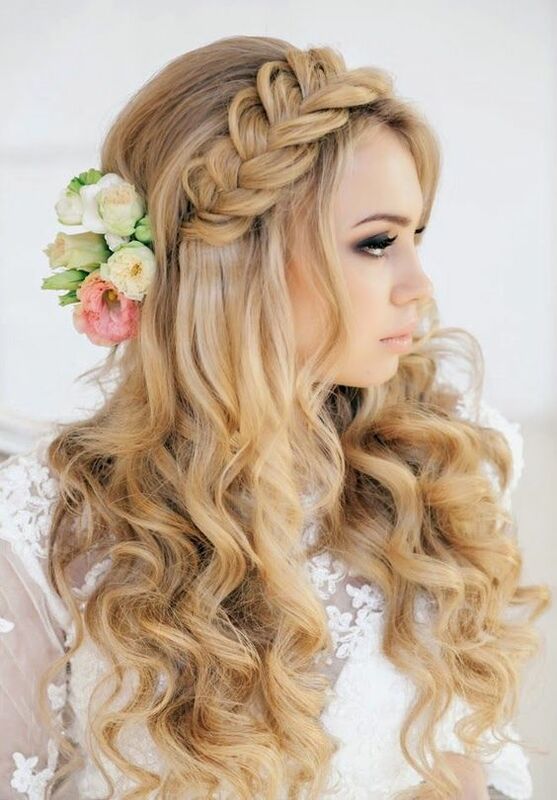 And some curly hair strands hanging along the face, which make this hairstyle more romantic and breathtaking. 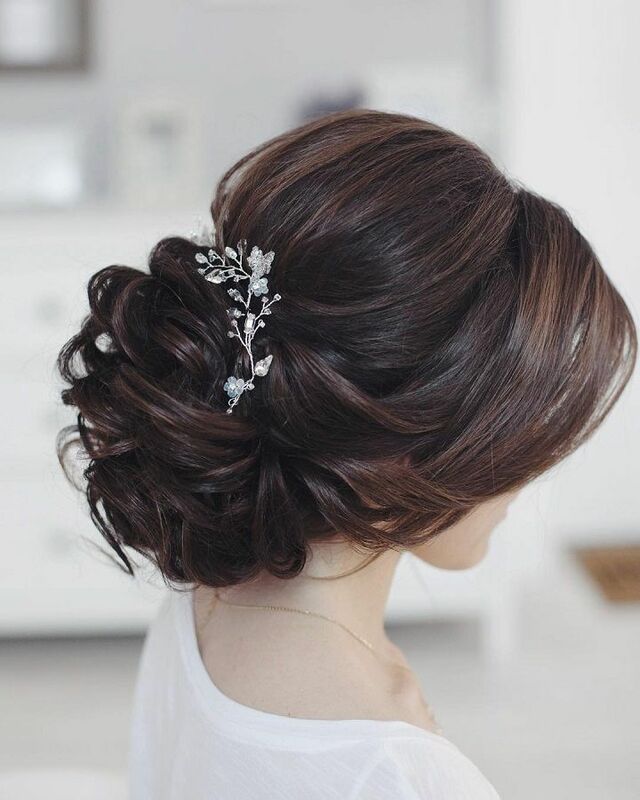 Brides with dark hair will look effortless charming just with this chic loose updo hairstyle. Some height has been created on the crown so that your head will havperfectrfet shape. 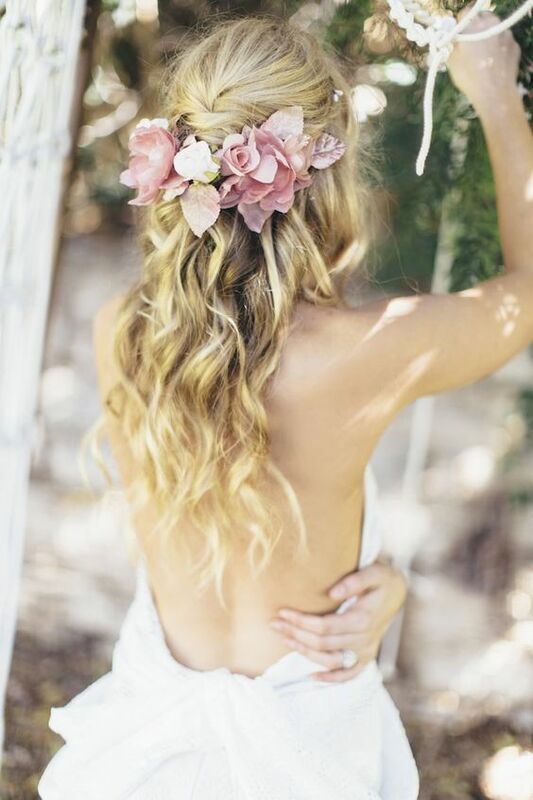 If your wedding is in spring or summer, it is a wonderful idea to decorate your bridal with some vivid colors. 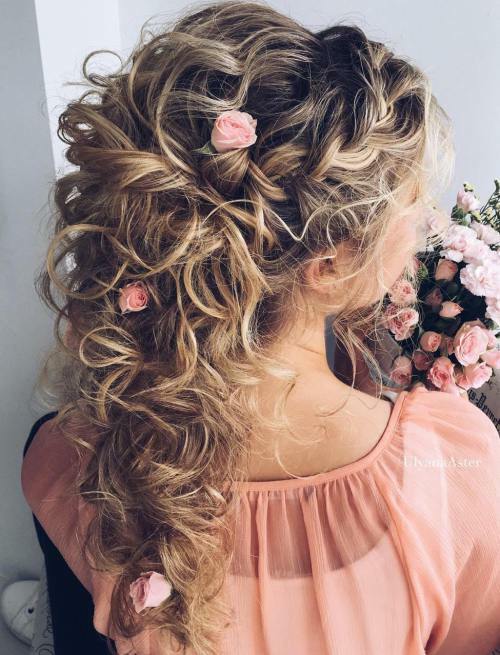 This braided updo is originally quite formal, yet it becomes a more beautiful brial hairstyle when an artifical pink flower with green leaves is added to it. 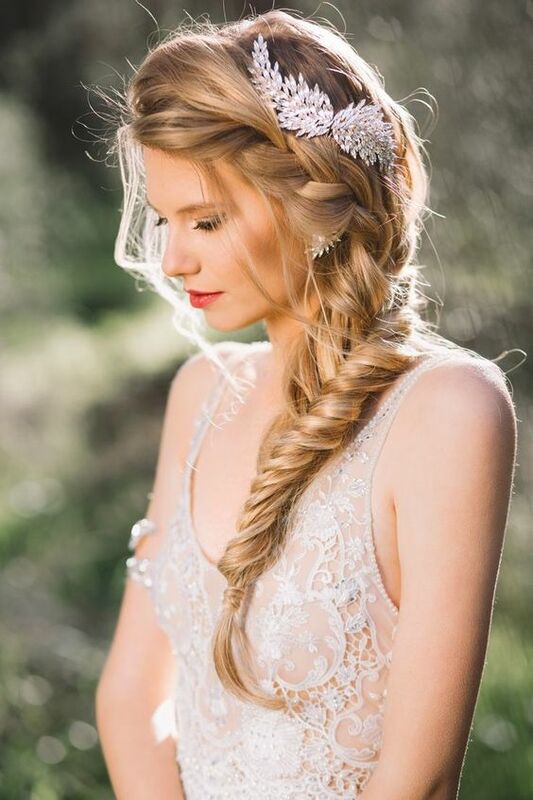 This braided fishtail hairstyle is quite a lovley bridal hairstyle for women who prefers a simple and minimal fashion taste. 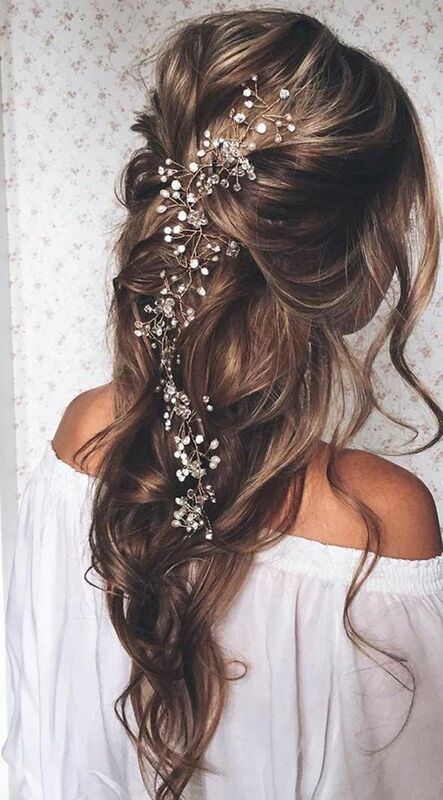 The two soft hair strands works well to frame the face and you just need a stylish hair accessory to make it more stunning for wedding. 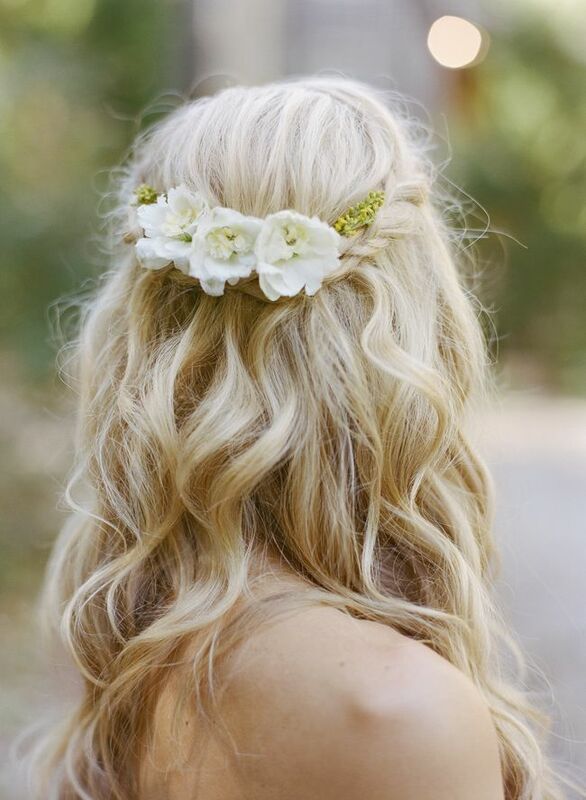 The pink flowers or some other pastel colored accessories look quite amazing on the light hair color. 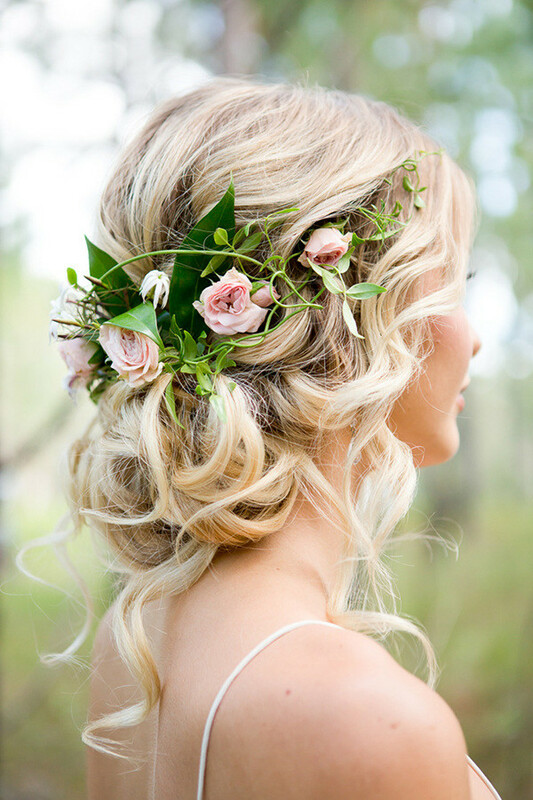 Therefore, younger brides will look highly beautiful with this simple yet stylish hairstyle. 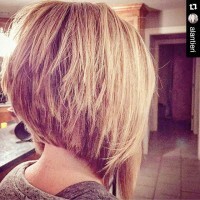 A side-parted hairstyle is very feminine for mature women to try. 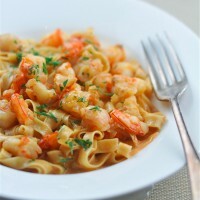 The soft curls really make the hair look full of life and movement. 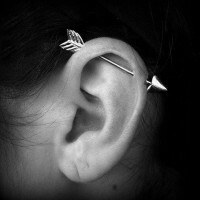 To make your ovearll look more stylish, you can copy this idea and wear long earrings and a diamond hair pin. 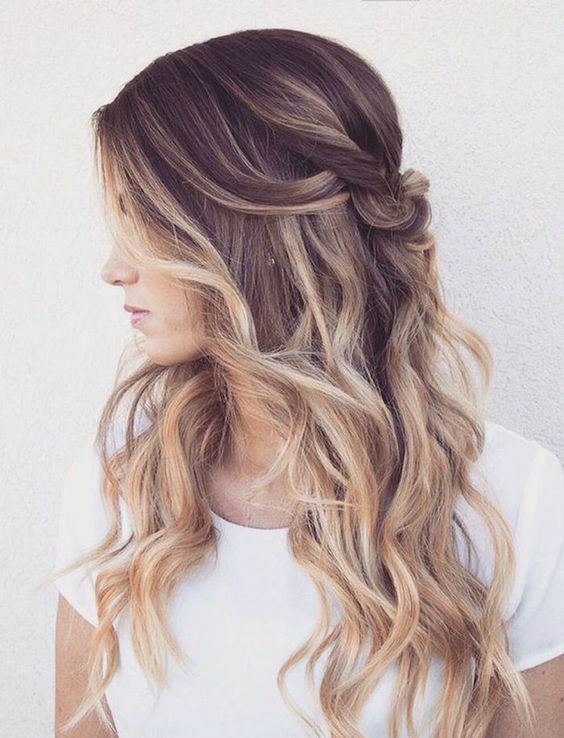 The bouncy curls look extremely amazing with the blonde hair color. 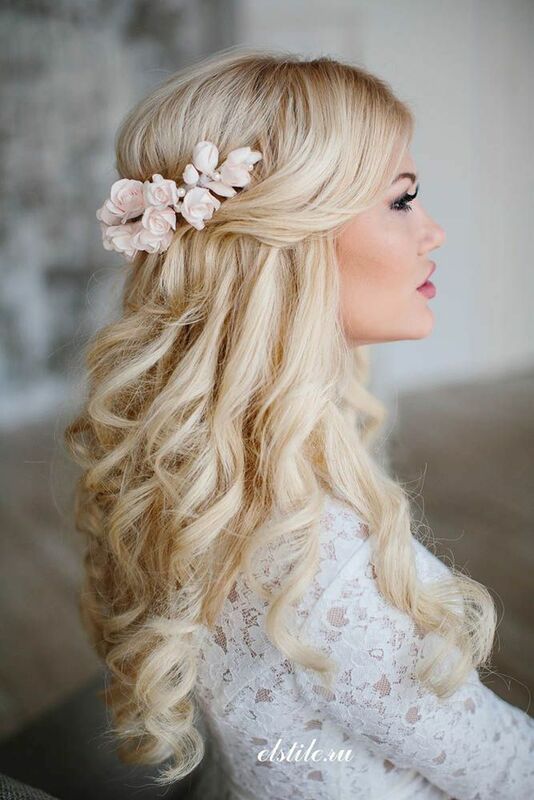 Such a gorgeous hairstyle is suitable for all brides with long hair. 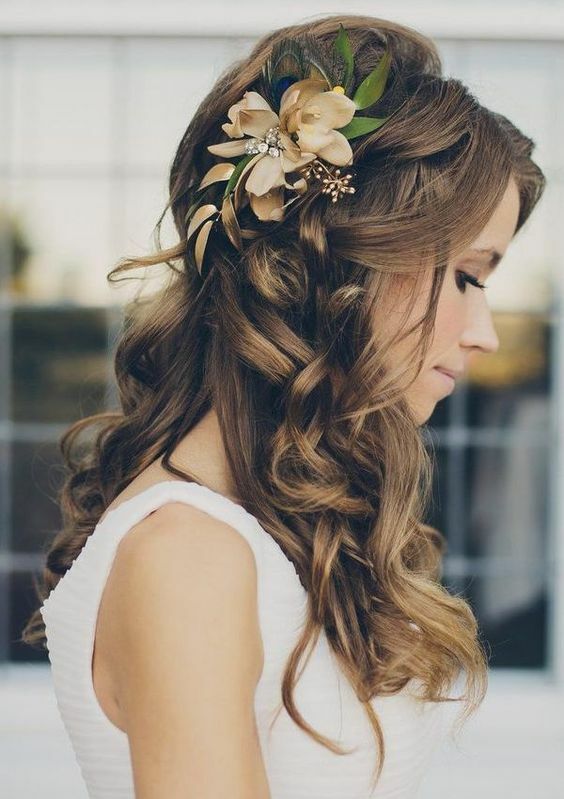 If you’ve got the chic brown hair, the red flowers hair accessories may not look so cool on your hair. So, you can choose a flower accessory whose color is similar to yet ligther than your own hair color. 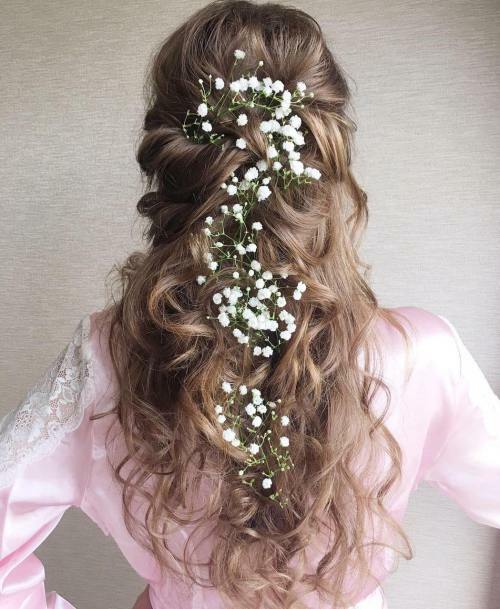 Thus, you’ll get a very trendy bridal hairtyle. 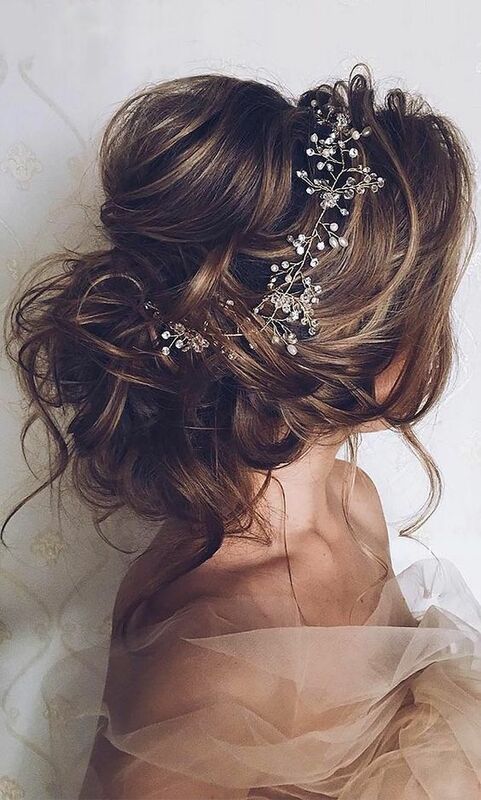 This messy hairstyle is really romantic for brides to try on their big day. 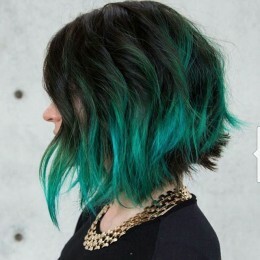 By the way, if you think your hair is thin and fine, this hairstyle will work for you. 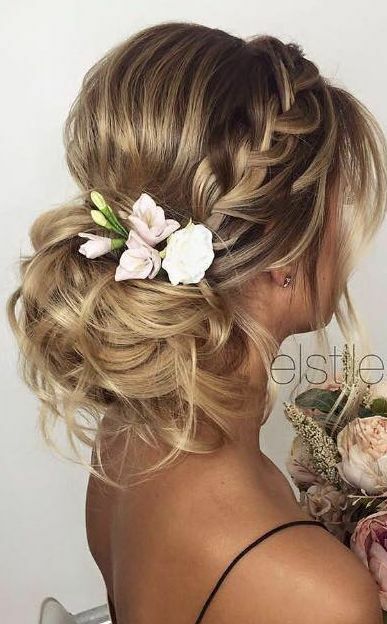 Let’s have a look at this wedding updo hairstyle. 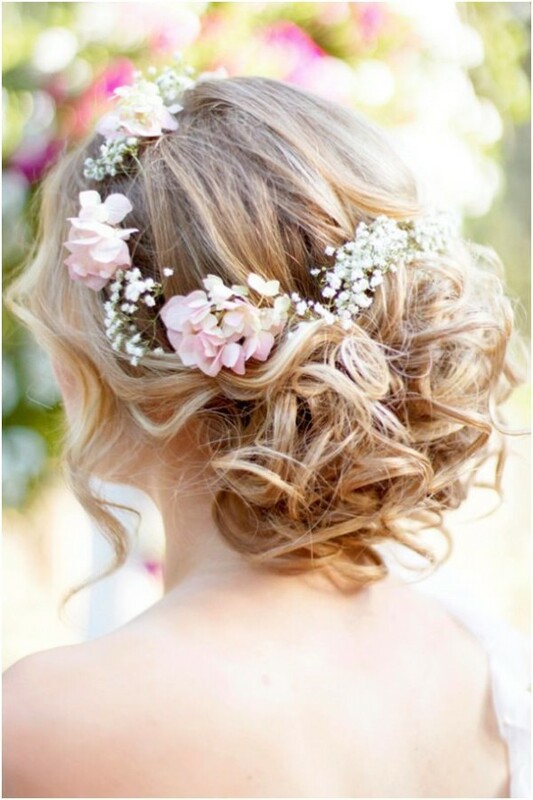 It looks very simple but the accessory successfully turns it into a more sophisticated wedding hairstyle. 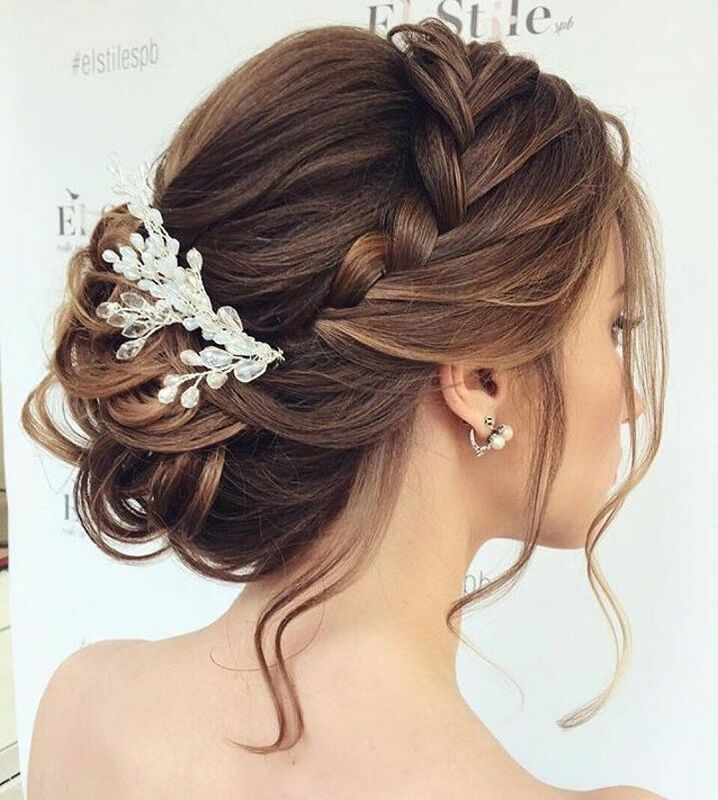 This is a classic bridal updo hairstyle for mature women. 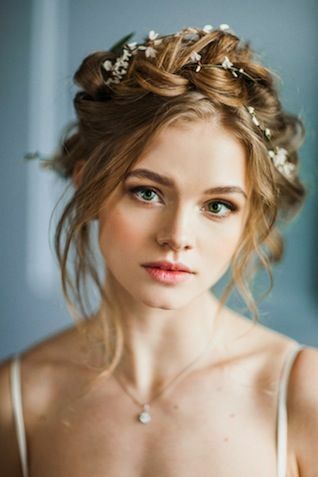 With some natural wavy hair left in the front to frame the face, this braided crown hairstyle is ideal for lovely brides who want an exquisite bridal hair look. 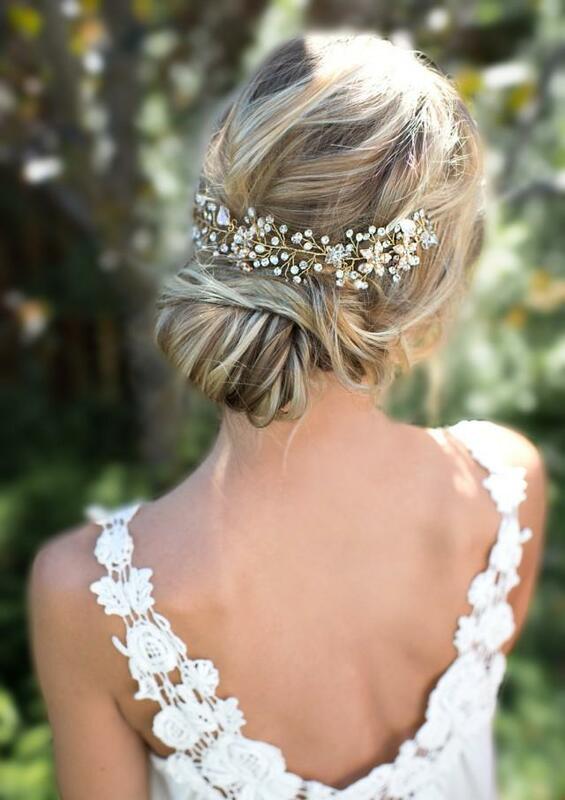 To be a fashionable bride, you should not miss this messy half-updo hairstyle. 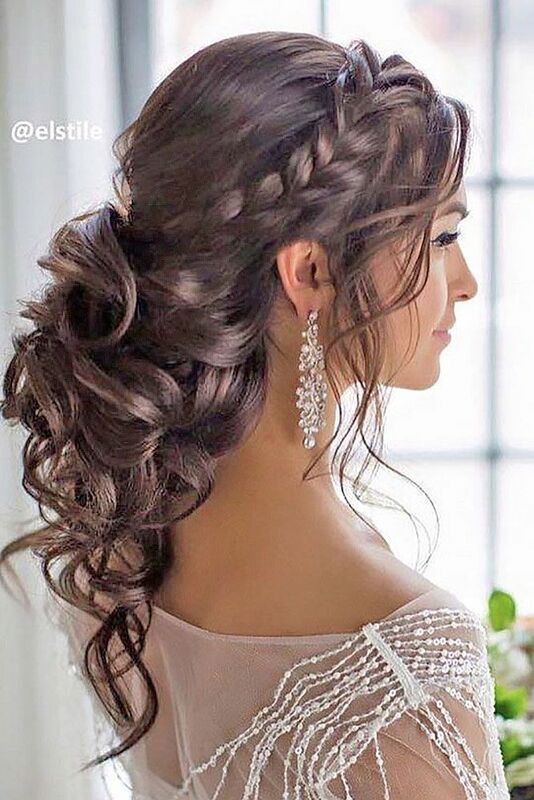 Mature women will look quite elegant on their wedding with such a classy updo hairstyle. 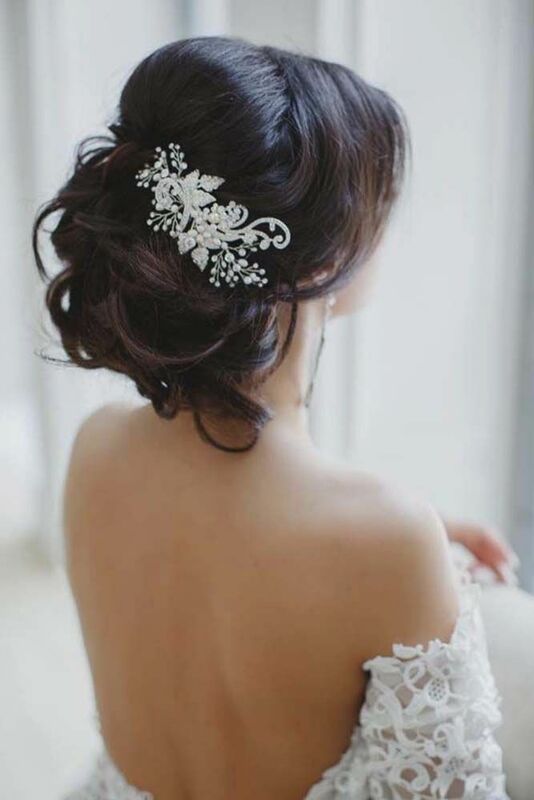 Style your brunette long hair into this sophisticated updo and you will be the most stylish bride on your big day. 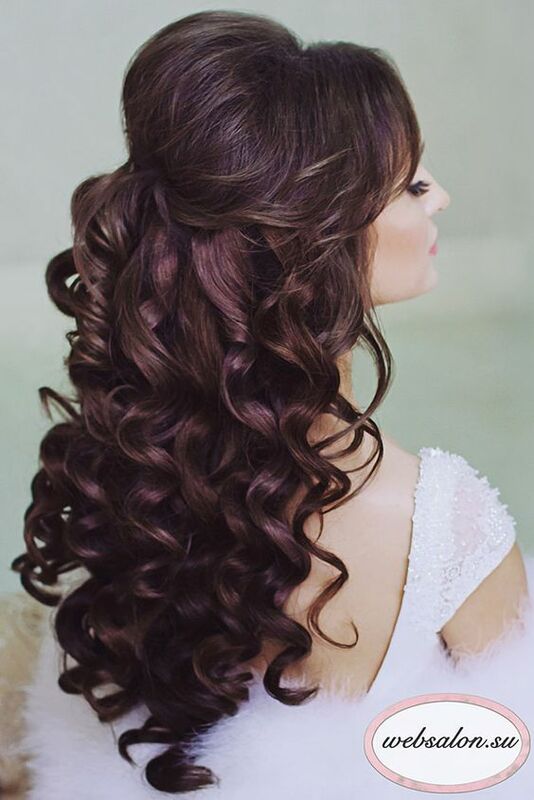 If you like the retro-chic hairstyle, then just wear this super stunning curly hairstyle on your wedding. 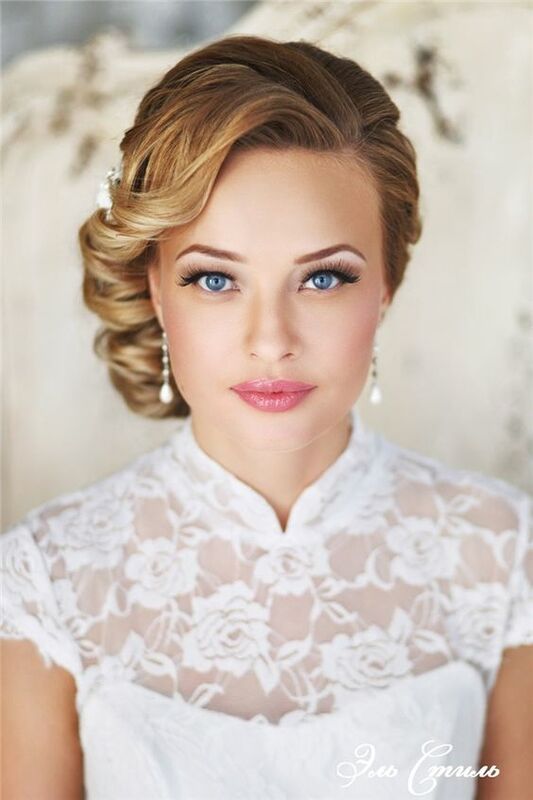 The side-parted bangs will make an updo hairstyle prettier for younger brides. 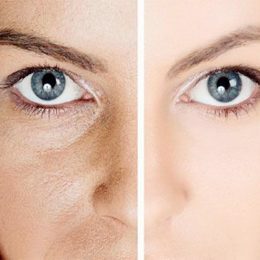 Besides, your face will be framed into a better shape. 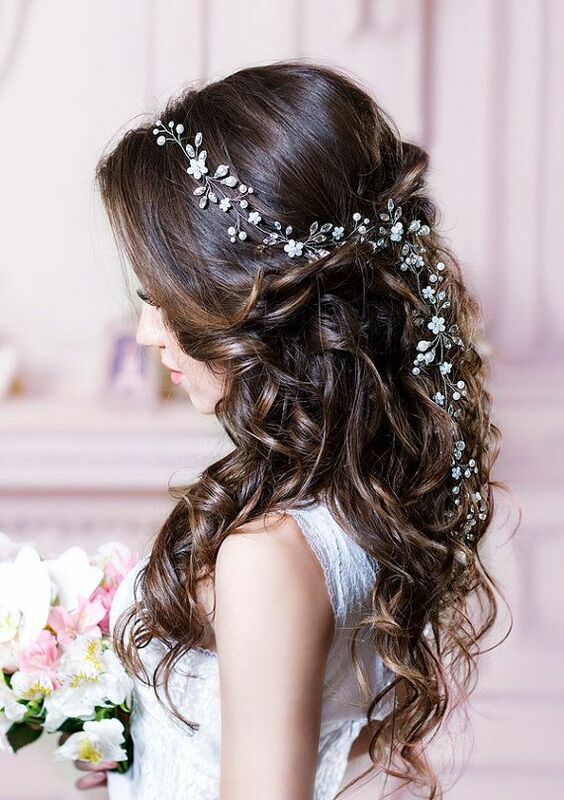 This ombre half-up half-down hairstyle is quite pretty as a wedding hair look. 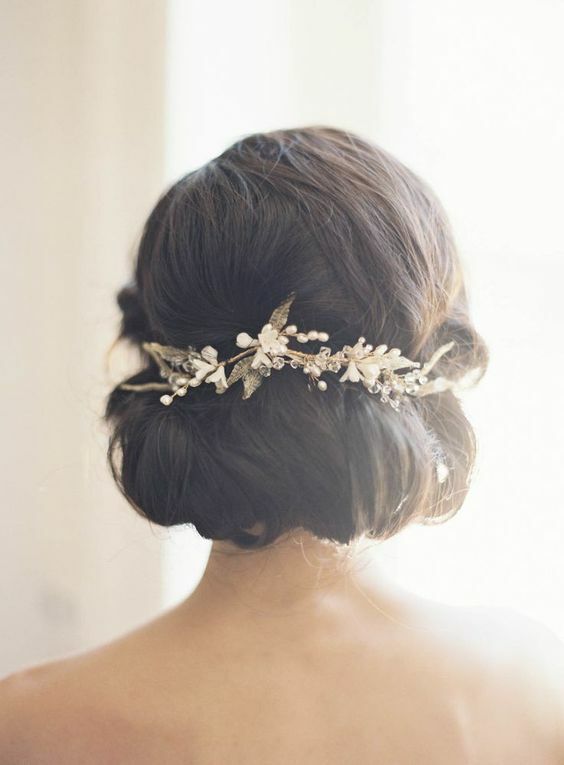 You just need to decorate it with some stylish hair accessories.